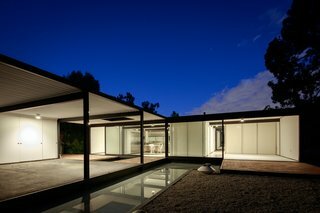 Known as the Bailey House, Pierre Koenig’s Case Study House No. 21 boasts two bedrooms, two baths, and a whole lot of charming midcentury detail. 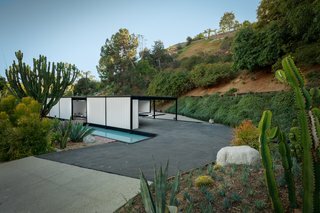 Designed by acclaimed architect Pierre Koenig, the Bailey House is a steel-and-glass residence located in the lovely neighborhood of Laurel Canyon. Constructed between 1956-58 for psychologist Walter Bailey and his wife, Mary, the celebrated architect used the project as an exploration into steel's potential as a building material—trying to find the balance between keeping costs down while maintaining high-quality finishes. 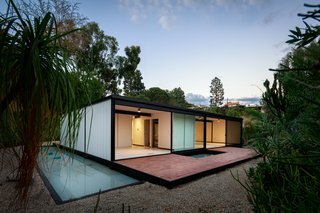 Nestled into its Laurel Canyon location, the home overlooks a shallow rectangular pool. The house has been listed on the National Register of Historic Places and has also been designated as the Los Angeles Historic-Cultural Monument #669, with a Mills Act contract providing significant property tax savings. The deceptively simple design makes it a well-recognized masterpiece of midcentury design. 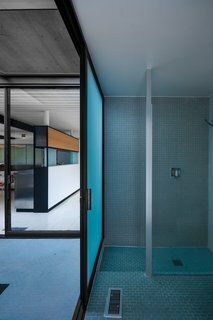 While Koenig was invited to oversee the restoration of the property in the late 1990s, more recently, the iconic home served as the Los Angeles outpost of the Seoul–based art gallery Seomi International. The 1,280-square-foot interiors are full of clean midcentury lines. 9038 Wonderland Park Avenue is now being listed for $3,600,000 by Aaron Kirman of Pacific Union International.